Namibia’s scenery is undoubtedly superlative. 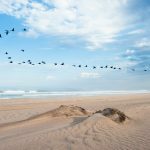 From the towering red dunes of Sossusvlei to the haunting stretch of the Skeleton Coast, the landscapes are monumental and can change before your eyes. Its abrasive climate means that safaris are focused on intoxicating panoramas and extraordinary vistas, although many animals that you may encounter are intriguingly rare and elusive. 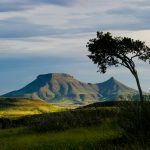 Bordering Namibia and Angola, Kaokoland is one of the last remaining wilderness areas in Southern Africa and is largely unfrequented by tourists. The Kunene river is an oasis amongst the surrounding barren landscape of rocky mountains and wide valleys. Embark on small boat trips down the river and explore the atmospheric Hartmann Valley in a 4x4, on foot or even on a quadbike. This area is also home to the nomadic Himba tribe whose female members cover their bodies in ochre and butter to create a dark red pigmentation. A day spent with this community offers a rare glimpse into one of Africa’s last nomadic tribes. 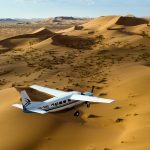 A flying safari is the most stupendous way of exploring Namibia, stopping at natural landmarks on the way. 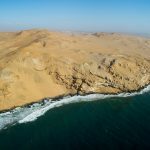 The desolate and treacherous coastline of the Skeleton Coast is hauntingly beautiful. The sea mist and powerful surf make for wild and enigmatic territory whilst you fly over washed up shipwrecks and massive seal colonies. Inland, the Ugab River formations are best experienced from a bird’s eye view – a moonscape of dramatic black ridges. It is a journey of extraordinary contrasts. 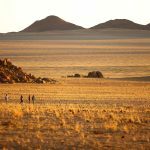 Soussuslvei is arguably the most famous part of Namibia, known for its soaring red dunes that boast the highest in the world. Early mornings here are crucial in order to reap the rewards of this spellbinding landscape. Hike up the dunes at sunrise for an overwhelming sight on terra firma. Another morning will allow you a different perspective in a hot air balloon floating above the 300km long sandy desert that unfolds in front of your eyes. East of the Skeleton Coast sits Damaraland, an arid mountainous region with imposing rocky landscape. 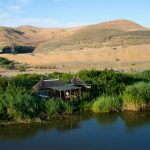 Explore this dramatic setting seeking out prehistoric rock engravings or tracking the desert adapted elephant and black rhino. Its sheer stark beauty makes for incredible dinners against a backdrop of staggering mountain scenery. 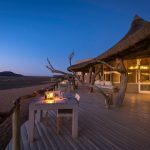 Namibia’s humbling landscapes, rich colours and unique safari offerings are quite simply unparalleled.